Ask any serial Netflix binge-watcher; they’ve probably seen The Great British Bake Off. This international hit, better known in the U.S. as The Great British Baking Show, is only up to 5 seasons on Netflix, but 9 for its regular British broadcasting on the country’s Channel 4 station. The weekly show introduces a new theme for each episode, and for its October 9th airing, contestants took on vegan baking. The bakers were not ecstatic, yet stayed hopeful about working in the kitchen without their usual eggs, dairy and meat; however, the emotions about the challenge were much stronger from viewers. Some turned to their trusty hashtags to crack down on the “waste of an episode,” as user @Jason_Carlisle dubbed it. Nonetheless, many GBBO fans were all about the show shaking things up and appealing to a larger range of viewers. And some even threw in a humorous jab. Unfortunately for some bakers, the vegan baking did bring challenge to the kitchen. Contestant Ruby’s vegan tier cake collapsed over on itself and several others struggled to make meringue for pavlova using aquafaba (or “chickpea juice,” as they called it) instead of egg whites. But #VeganWeek still proved successful in many cases. Plus, baker Kim-Joy, who won “Star Baker” of the week and earned one of judge Paul Hollywood’s famous handshakes, concluded the three-challenge vegan episode with a carefully crafted tier cake. Her lavender and lemon curd creation was frosted with pastel colors and adorned with adorable fox and mushroom cookies. Although the week of vegan baking has come to an end, and without mention of seasonal return, The Great British Bake Off successfully highlighted that while baking with vegan substitutes can be a challenge, it is rewarding, delicious and definitely possible! Not to mention, the plant-based baking even brings in a larger audience and adheres to dietary and allergy restrictions. Feeling inspired to whip up some vegan baked goods? 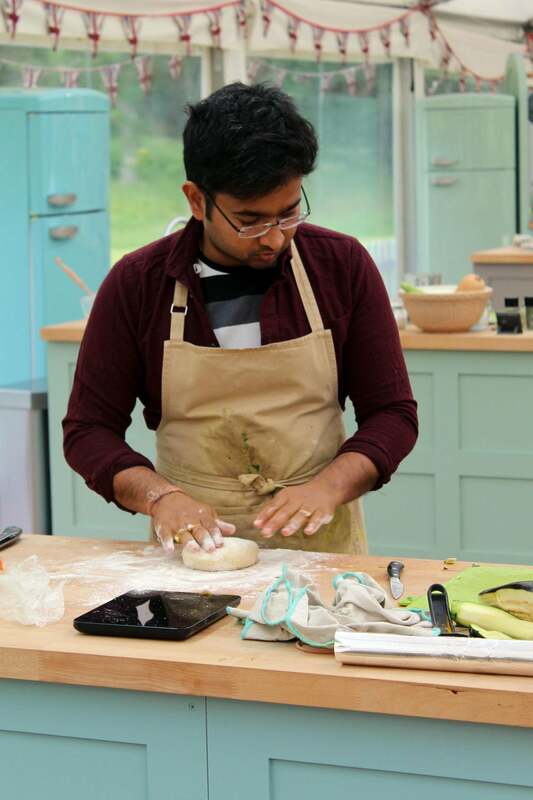 Luckily, The Great British Bake Off website has posted the best recipes from #VeganWeek, like Kim-Joy’s fox cake, Briony’s Hazelnut Mocha Cake and Rahul’s Chugni Chaat Tartlets. Or, if you’re looking for a recipe that’s a bit more beginner-baker style, I have a Pinterest board that is stacked with delicious baked goods, savory and sweet (and vegan, of course!). I have never heard of this course! I think it is really cool how yo incorporated Cal Poly in you blog. It shows relevance to locals and also shows who you are too.